The leading online casinos like the ones recommended here at CasinoSites.com.au all come in instant play mode, which means games can be played directly over your Web browser with no downloads required, but if you prefer to download separate casino software where games can be played directly from the computer desktop without having to open an Internet browser, read on to find the best downloadable free casino software. 1. Go to a trusted downloadable casino site like Royal Vegas Casino. 2. Click the ‘download’ link from the home page and the download process will begin immediately. 3. When presented with the pop-up box, select the ‘run’ button to continue, the software will now begin to be downloaded to your computer. 4. Another pop-up box will appear asking if you want to install the software, click run again and follow the prompts to confirm you wish to install the casino software. 5. Once the installation is complete you’ll be asked to either sign-in or register for a new account – follow these prompts and you’ll be taken to the downloaded casino lobby, ready to play games in their highest quality. For information regarding the hardware requirements needed on your computer to allow the download, head to the help or FAQ section of the casino site. Part of the highly reputable Fortune Lounge Group, Royal Vegas Casino is one of the longest running casinos on the Internet. Players have two choices – follow our links to access games directly in browser mode, or click the ‘download our free premium casino software’ button from the Royal Vegas homepage. Depending on your computer speed, the download should only take a few minutes to install. If you already have an instant-play account you can use the same details to login to the downloaded software, or follow the prompts to sign up for a new account and take advantage of up to $1,200 in welcome bonuses. Once logged in you’ll be taken to the game lobby, which looks considerably different to the browser based site (as pictured). Click the icons along the bottom of the lobby to view games, promotions, news, banking or your account details. You can now log in directly from your computer desktop, but will still require an internet connection to place real money bets. When it comes to premium casino software Microgaming can’t be beat, but Playtech provides a pretty close second best, powering a considerable amount of the Internet’s downloadable casino software. Playtech is one of the largest suppliers of online casino games and is traded on the London Stock Exchange Main Market. Its downloadable software is powered by the Enhanced Gaming Engine platform (EdGE), with a collection of over 500 games from 25 suppliers. At CasinoSites.com.au our preference for downloadable software is 100% for Microgaming, but if you’re looking for some variety then Playtech’s downloadable software gets our next vote. Is downloadable software worth getting? Considering that casino software is free to download and only takes a couple of minutes to install, whether it’s worth downloading or not depends on your personal gameplay preference. Playing with downloadable software is noticeably different in terms of layout, but ultimately the games and bonuses remain the same whether you use instant play or downloadable mode. 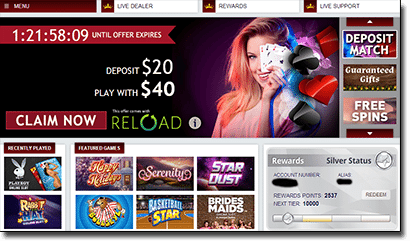 To see what premium casino software is like, head to Royal Vegas where you can claim up to $1,200 in welcome bonuses to use on both the browser based and downloadable sites so you can see which format you prefer.